The 25th annual Society of Motor Manufacturers and Traders (SMMT) annual Test Day took place on 25 May at the Millbrook Proving Ground, near Bedford. More than 177 models from 35 brands were put through their paces by around 150 journalists; written, sound and visual. Products ranged from city cars, SUVs, through to sports models, family cars and four-wheel drive offerings designed for off-the-road activities. It is not a day for serious road testing more of a networking occasion. Riding in the back of a DB11 on a high-speed bowl is unusual and not part of daily motoring life. 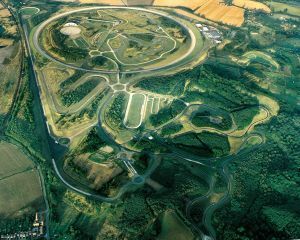 Millbrook is one of the largest vehicle testing centres in Europe and comprises a two-mile high-speed bowl; the hill route, three miles of twisty Alpine roads with nothing coming the other way, and an awesome off-the-road course which scribes were only allowed to use accompanied by a demonstrating driver from the host supplier. There is also a short ‘city course’ meant to represent the type of roads met when driving in town. Some manufacturers also allowed their products to be driven on the public highway. The fact that the Millbrook road surfaces seem to have deteriorated perhaps reflects the pothole state of many of the nation’s highways. Or is it a cunning scheme to actually replicate the roads of the country. See ‘pothole blackspots named’ in this issue. Mike Hawes, SMMT Chief Executive, welcomed guests with a summary of the industry’s current state of heath, noting that in spite of the political uncertainty the motor industry continues to thrive and is Europe’s second biggest car market and the third largest producer. Last year new registrations reached a record 2.7m and 8.2m used cars changed hands with the UK exporting 1.4m cars to more than160 counties worldwide. Make what you like of these figures but 69% of UK car imports came from Europe and 56% of exports went the other way. With components 79% came from the EU and Britain supplied 65%. Just to put things in perspective 69m vehicles were registered worldwide in 2016, of which 24m were in China, 17m in Europe, and just under 7m in the USA. Over 4m Volkswagen were assembled in China. The top sellers in the UK for 2016 are as listed with petrol engine cars representing just over 50%. For 2017 a dramatic drop in diesel sales is expected. According to the SMMT report for the last five years white has proven to be the most popular colour, last year sales of small cars rose by 230%, SUV’s increased by 150%, whilst luxury vehicles and sports car sales were both over 20% down. Thursday 25 May was a warm dry spring day. BTN thought it wise to concentrate on open top cars, and as you will see by reading on that these ranged from the ridiculous to a Steve McQueen special, sadly the disappointment of the day. The following are but cameo reviews and should not be confused with a full road test. Hopefully BTN will be allowed full appraisals in the coming months, but we have not praised all the cars and it may be that you will have to look elsewhere for a further observation. It might be the Green party’s favourite car, and suitable for its single MP to take to Westminster with a junior in the back seat, but the Renault TWIZY is never going to be a big seller in the UK. Renault, and full marks to them for bringing it along to Millbrook, say that the biggest market is Monaco where it can park head-on to the kerb, and its 50-mile range gives it plenty of scope within the principality. At around £7,500 it is somewhat expensive in the UK for home delivery pizza suppliers whose scooter runabouts are somewhat cheaper. First launched in 2012 as a battery-powered two-seat electric city car it is manufactured in Spain and is legally classified in Europe as a heavy quadricycle. Top speed is 25mph and it is topped up by plugging it into any standard electric outlet. Expect to wait at least three hours if it is completely flat. It is a one plus one with a roof and open to the elements at the side although a perplex window is available as an option. It was also suitable for the city course and did not get in the way of faster vehicles. 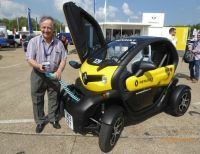 The Renault TWIZY is best described an ‘an experience’ not likely to be repeated by this tester, but was fun. Who would have thought back in 1948 that there would be a proper convertible version of the Land Rover. But then the Evoque itself was a break away from the conventional classic chassis that had traditionalists scratching their heads. Both model ranges are selling well and others are replicating this ‘open to the sky’ of the off-the-road concept, surely the best compliment of them all. Whether the Chinese will copy, as per the Landwind we wait to see, but you can be assured that the government of that country will do nothing about this flagrant cheating. Nothing changes with China. All four/five-seat convertibles are a compromise in terms of weight and boot space and such was the case with this offering, a 180hp two-litre turbodiesel with a (very smooth) nine-speed automatic box. At 0-60mph in 9.7sec it is only respectable in the traffic light stakes and the 120mph top speed is academic. The dashboard layout and on the road controls are purely Jaguar. For normal road use this model Evoque Convertible comes with parking sensors, xenon headlights, electrically adjustable front seats, leather upholstery, cruise control, lane departure warning, and Land Rover’s 10.2in infotainment system complete with Bluetooth, USB connectivity, sat nav and a rear-view camera. There was no offer of an escorted off-the-road trip but the car comes with all that one expects with Land Rover including hill descent control, and terrain response. Part of the package are 20” alloys; on the hill circuit it performed with ease within its performance limitations. Expect 40mpg. One of the great muscle cars of history the Ford Mustang offered at Millbrook was a disappointment. Bedfordshire might not be San Francisco and your scribe no Steve McQueen but a six-speed manual box just did not feel right. The problem was that the 5-litre automatic available created a great demand and this scribe could not get his hands on it. With the auto one could put one’s foot down on the hill section and use the brakes to their utmost. The 2.3 turbocharged car was just hard work changing up and down. To their credit the Mustang is a terrific return to form from Ford, and the perfect flagship sports car for North America. Well done Dearborn in making a right-hand drive version available. The 2017 Mustang has striking, modern looks that manage to integrate some retro touches, so it’s instantly recognisable, while Ford’s engineers have produced a chassis that delivers fine modern handling combined with a comfortable ride. If you are looking for an open top true sports car that will turn heads and don’t want to spend more than £40k, the British Mustang might be for you. The bad news is that journalists over75 are not allowed to drive Ford press cars. Does this mean that Ford does not want to sell to people of mature years? Some say that it evolved from the Lotus Elan Sprint of the early 1970s but whatever its evolution the Mazda MX5 is the world’s greatest selling sports car with now over one million produced. There is even a legal lookalike built on the same production line called the Fiat 124. Four distinct versions of the Mazda were at Millbrook – MX5 1.5i, MX5 RF, Fiat 124 Spider, and Abarth 124 Spider. All the cars have a very similar interior and dashboard layout with a choice of trim, but from the front at least they do look different. Depending on the specification they are not all the same to drive, with a variety of engines and transmissions. In Europe the British have unbridled optimism when it comes to open top cars. Just a few days of sunshine and suddenly one can see Mazdas of all sorts of vintage rushing around with their hoods down, plus plenty of elderly MGs, Lotus and its Caterham offspring, Peugeot 207/208 hard-tops, and of course the upmarket Jaguars and Porsches. Despite the UK suffering from notoriously unreliable weather, when it comes to European sales of convertibles, we come second only to Germany. It could be that Mazda has got it wrong with the latest version of the MX5 with 80% of the previous generation car sold with a folding hard-top. The year after the launch of the fourth-generation soft-top, the new Mazda MX-5 RF, which stands for Retractable Fastback (or hard-top to you and me) is going on sale. The three-part roof made from steel, aluminium and plastic has a hands-free electrically folding roof mechanism. Some may like the new rear styling, others not so. No more the tucked away soft-top and a fine view of what is behind on the road. The glass rear window and roof-folding mechanism serves to add more weight higher up in the body. A 2.0-litre-engined RF weighs 45kg more than the equivalent soft-top. Not ideal in a car praised for its low-weight ethos. To counteract any unwanted dynamic effects, Mazda has beefed up the front anti-roll bar, tweaked the damper settings and sharpened up the steering, all to ensure that the RF drives as similarly to its sibling as possible. The RF is a noisy car. Beyond 50mph the drone behind your head, caused by the wind being trapped by the rear flying buttresses is loud enough to curtail any conversation you were having with your passenger. It is not that quiet with the roof up either. If you want a semi open-top MX5, the RF might be for you. It certainly has more luggage space. But it is a step in the wrong direction for the original concept. How nice it was to jump into the Fiat Abarth and blast around the high-speed bowl, stopping at one point in the safety area and putting the roof up to see the difference. A quiet enough experience but on what was a true-blue sky day it was back in after one lap to once again drive in fresh air. There was just not time to try the variety of BMW and Mercedes 2+2 dropheads available and not surprisingly they seemed out the whole time. Some manufacturers offered timed bookings on the day, others first come first served. With Porsche, it was strictly bookings only this year, and with a driver. BTN did not manage a drive. Our choice of upmarket cabriolet was the new Audi S5 cabriolet a fast and extremely high-quality piece of kit. It is a real four-seater with the front accommodation quick to move back to allow access to the back, and much faster than some of its rivals. Plenty of boot space for two people on touring holiday. With roof down on the high-speed circuit, and a diesel engine under the bonnet it was a real pleasure for a relaxing drive. On the hill circuit no overtaking is allowed which means that some of the younger journalistic element tend to queue up behind knowing that the slightest move means a red flag from the ever efficient marshals. Yellows were the norm if you were seen to be exceeding the sections speed limit. According to published figure the extra weight over the coupe means performance suffers, on paper at least. Despite the 349bhp 3.0-litre turbocharged V6’s best efforts, 0-62mph takes 5.1 seconds, which is four-tenths slower than the hard-top.